Black w/ Yellow Straps. 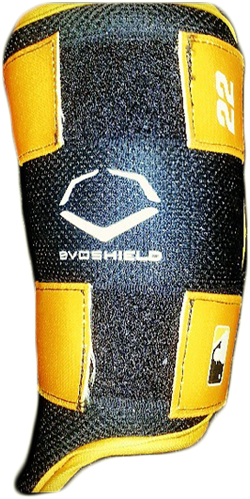 McCutchen wears an exclusive Evoshield leg guard with no protection over his foot, just like in the feature. He was so proud of it, Cutch threw it on Instagram for us to swoon over. Categories: Gear, Outfield, Leg Guard, Pittsburgh Pirates, Andrew McCutchen.